Sci Rep, 2016, 6:24838.. C646 purchased from Selleck. A. Immunoprecipitation of HSP90 from NT, shHSF1 or shHSF1 Mec-1 cells treated with 20 μM, C646 for 24 hours followed by immunoblotting for acetyl lysine and HSP90 (top panel). Immunoprecipitation of CDC37 followed by immunoblot analysis of HSP90 and the indicated HSP90 client kinases (bottom panel). Oncotarget, 2015, 6(31):31767-79.. C646 purchased from Selleck. (E) si-P300-3 and C646 separately suppressed the Res-induced mRNA expression of VEGFb, VEGFR1, and VEGFR2 in differentiated PC-12 cells (*P<0.05, **P<0.01, ***P<0.01). Front Neurosci, 2018, doi:10.3389/fnins.2018.00341. C646 purchased from Selleck. The expression of Dtprp in stromal cells at 96 h decreased in a dose-dependent manner when stromal cells were treated with histone acetyltransferase inhibitor C646. Biol Reprod, 2015, 93(1): 13. C646 purchased from Selleck. Left: The protein level of acH4K5 in the DMSO and C646 5 µM groups. H4 was used as a loading control. Right: The expression level of cyclin D3 decreased in the C646 5 µM group compared with the DMSO group detected by Western blotting analysis. Protein lysates for Western blot analysis were obtained at 48 h after C646 treatment. C646 attenuates ETV1 expression and inactivates KIT-dependent pathways. GIST882 cells were treated with C646 (5-20 μmol/l) for 24 h. Imatinib (500 nmol/l) alone or in combination with C646 (15 μmol/l) was used for the combination study. DMSO was used as the vehicle control. The expression levels of ETV1 and KIT-dependent pathway-related proteins were analysed by western blotting. GAPDH was used as a reference. ETV1, ETS translocation variant 1; GIST, gastrointestinal stromal tumor; DMSO, dimethyl sulfoxide; GAPDH, glyceraldehyde 3-phosphate dehydrogenase. Oncol Rep, 2016, 36(5):2763-2770.. C646 purchased from Selleck. Extensively used as a pharmacologic probe in cancer cells. Potential use for prostate and lung cancers. IC50 values for the putative p300 HAT inhibitors are determined using the direct radioactive assay described above. Reactions are performed in 20 mM HEPES (pH 7.9), and contained 5 mM DTT, 80μM EDTA, 40μg/ml BSA, 100μM H4-15, and 5 nM p300. Putative inhibitors are added over a range of concentrations, with DMSO concentration kept constant (<5%). Reactions are incubated at 30°C for 10 min, then initiated with addition of a 1:1 mixture of 12C-acetyl-CoA and 14C-acetyl-CoA to 20 mM. After 10 min at 30°C, reactions are quenched with 14% SDS (w/v). All concentrations are screened in duplicate. Gels are run, washed, dried, and exposed to a PhosphorImager plate, and production of Ac-H4-15 quantified to obtain IC50s. 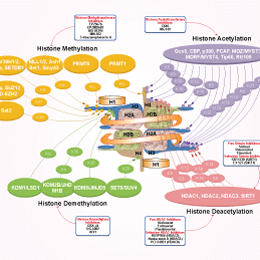 Method: Histone acetylation assays in mouse cells. C3H10T1/2 mouse fibroblasts are grown in DMEM with 10% FCS at 37°C with 6% CO2. Confluent cultures are rendered quiescent in DMEM with 0.5% FCS for 18-20 hr prior to treatment. Cells are treated with the following compounds: TSA (10 ng/ml [33 nM]), C646 (25 μM), C37 (25 μM). Antibodies are used at the following concentrations: total H3 (1:10000; ab7834; Abcam); H4K12ac (1:2500; 06-761; Upstate). 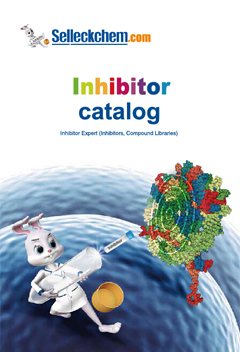 Rabbit anti-H3K9ac (1:10000) antibodies are generated in-house. Histones are isolated from cells by acid extraction, separated by SDS and acid-urea polyacrylamide gel electrophoresis and analyzed by western blotting. Bowers EM, et al. Chem Biol, 2010, 17(5), 471-482. Santer FR, et al. Mol Cancer Ther, 2011, 10(9), 1644-1655. Crump NT, et al. PNAS, 2011, 108(19), 7814-7819. Marek R, et al. J Neurosci, 2011, 31(20), 7486-7491. I am planning to conduct IP studies in mice, any specific vehicle that you can recommend to me? We found it can be dissolved in 5% DMSO+30% PEG 300+ddH2O at 1 mg/ml as a clear solution. It should be ok for i.p. injection.